Your timing belt is a critical piece of your engine’s puzzle. It synchronizes the crankshaft in the lower part of the engine with the camshafts in the upper end. 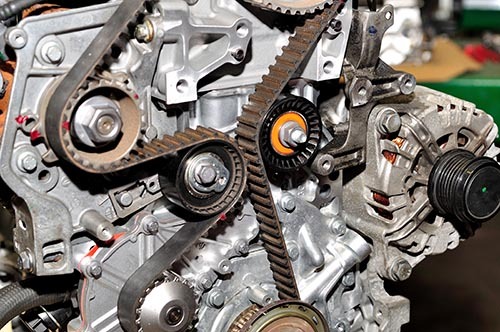 The toothed timing belt is precisely installed to make your engine timing accurate. If the belt skips a tooth, or if the timing belt breaks, this could spell catastrophe for your engine. At a minimum, your engine will run poorly. Over time, the timing belt wears down just like other rubber components. It eventually needs to be replaced, typically every 50,000 to 70,000 miles. Timing belt replacement will keep your engine running strong. If your timing belt fails, your engine will come to an immediate halt. In addition to the inconvenience of a time-consuming breakdown, you’ll have to get towed. Such preventive maintenance as timing belt replacement ensures you can trust your car for tens of thousands of miles ahead. When your timing belt replacement is due, or if you’re not sure when it was last changed, come to Mode Automotive in San Diego for a timing belt inspection. Our ASE-Certified technicians are extensively trained, using cutting-edge equipment for an accurate diagnosis and precise repairs. Whether your Plymouth needs a timing belt replacement, your Pontiac isn’t running normally, or your Acura needs an inspection, Mode Automotive will take care of you. 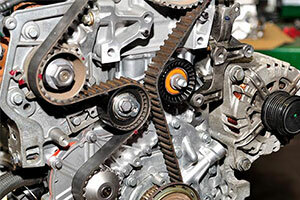 For knowledgeable, affordable timing belt replacement, visit the experts at Mode Automotive in San Diego, CA. Call us today or use our convenient online appointment form to schedule your visit.